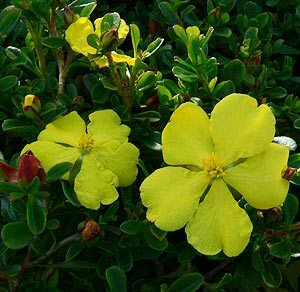 Commonly called the Snake Vine and Guinea flower, Hibbertia scandens is an excellent ground cover plant with attractive yellow flowers from spring right through summer. Wholesale growers offer thi and a number of other species that are suited to a rang of landscaping uses. Excellent in coastal environments where it copes well with sandy soils, also suited to other areas that are predominantly frost free. Spreading over 2m and reaching around 50cm in height it is easily pruned to maintain shape and size. H. prostrata – A low growing ground cover plant reaching around 15cm in height. Spreads to around .5m. H. vestia – Another prostrate species to around 25 cm in height. H. obtusifolia – Small shrub to around .5m in height. H. procumbens – Popular ground cover variety with a number of named varieties. H. aspera – Small shrub to around 60cm. Excellent plant in commercial landscaping situations where a low care ground cover is required. Can also be trained for use as a climbing plant however will need support.